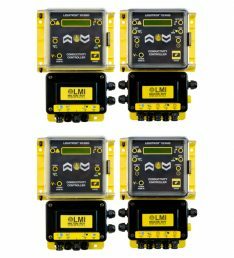 By Far, LMI Pump Controllers are the first choice in the water treatment industry and used by many professionals for simple chemical addition to control conductivity, pH and ORP. LMI Controllers are superior in design and rugged construction of our controllers add the value and reliability you expect from an industry leader. DC4000 Cooling Tower & Boiler Controller may be programmed for bleed & feed, DC45000 Cooling Tower Controller is bleed & feed with dual timers, DP5000 pH Controller for industrial pH applications, DR5000 ORP Controller for water treatment, metal finishing and PCB manufacturing, FS5000 Flow Switch Controller and Time Switch which is digital.